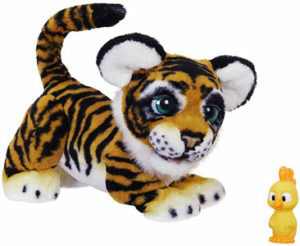 From the popular FurReal Friends toy line comes a new cuddly and playful tiger named Tyler. Unlike classic stuffed animals, FurReal Friends interact with your child to be much more entertaining than plush toys that just sit and collect. 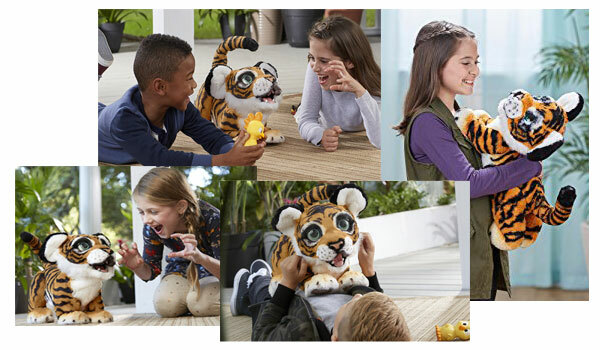 Have your children roar at FurReal Roarin’ Tyler the Playful Tiger and listen to him roar back in response. This is as close to a pet tiger as most will get. In fact, it’s even better than a real cat or dog – since there’s no mess or hassle! FurReal Roarin’ Tyler the Playful Tiger has over 100 responses to things your children do or say to him. He can make sounds as well as move about to interact with kids. Give him his squeaky toy chicken and watch him respond to your kindness! This toy tiger can move his eyes, ears, head, mouth, and tail when your children are playing with him. Roarin’ Tyler likes to have his head patted and his back rubbed, and will respond accordingly to your positive affection. He even crouches down into an adorable pose when he’s ready to let out his big, adult-sounding roar. When it’s bedtime, take along FurReal Roarin’ Tyler the Playful Tiger for a super snuggly friend. His soft fur is downright irresistible to a drowsy child ready to fall asleep. 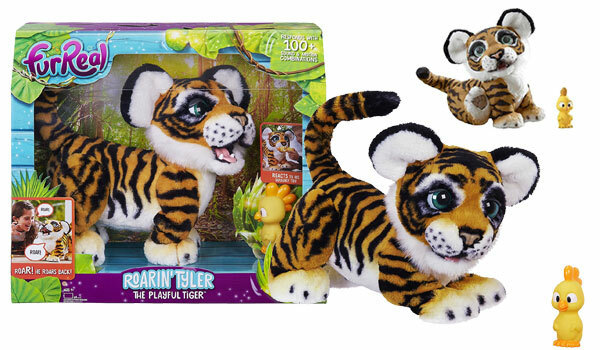 FurReal Roarin’ Tyler the Playful Tiger is designed for children ages 4 and up. He weighs about 10 pounds, so he may be slightly heavy for younger children. But it’s the perfect weight and size to pretend you are caring for a real baby tiger! He also requires 4 “C” alkaline batteries that are not included with this adorable stuffed toy. FurReal Roarin’ Tyler the Playful Tiger will go to sleep after two minutes of inactivity to help save on the batteries. You can also manually turn off the animal using the switch in the battery compartment. This is very helpful when it’s nighttime and you don’t want to hear him roaring!